MS 193 T A compact professional chainsaw with a powerfully efficient engine. The MS 193 T is affordably priced and packed with premium features that save time and money. Professional arborists and tree service personnel will appreciate its robust power-to-weight ratio and compact, ergonomic top-handled design for easier equipment handling and less operator fatigue on demanding jobs. The tool’s fuel efficient engine technology reduces fuel costs and emissions*. The MS 193 T comes with a convenient toolless retainer for the air filter cover, a lanyard ring, purge pump primer, and IntelliCarb™ Compensating Carburetor. 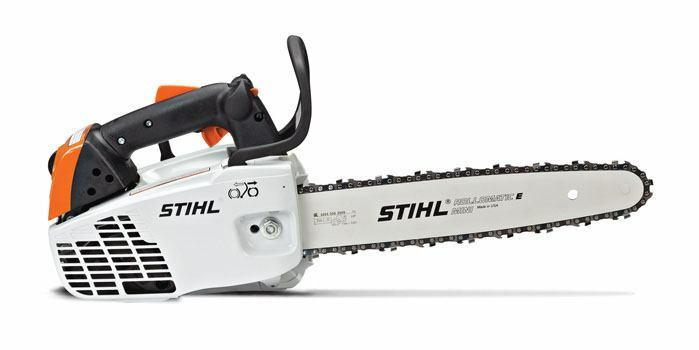 This easy-to-operate STIHL product is proudly built in America* for the demanding professional who wants a premium saw at an affordable price. *A majority of STIHL powerheads are built in the United States from domestic and foreign parts and components. Reduced fuel costs and emissions are ascompared to the previous model (MS 192 T). EASY2START™ SYSTEM: Reduces the strength and effort needed to start the engine.